Indian Institute of Management Amritsar is pleased to announce the inauguration of 3rd batch of Post Graduate Programme in Management (PGPM) on 10th July, 2017. The programme was conducted successfully in the presence of dignitaries from the industry, academia, the excited students and their proud parents at the Punjab Institute of Technology building, Government Polytechnic Campus, Amritsar, Punjab. The inauguration program began with traditional lamp lighting ceremony by the Shri Sanjay Gupta, CEO & Director, Jagran Prakashan Limited and also the Chairman of the society & Board of Governors of IIM Amritsar. It was followed by a welcome speech by Prof. Geetha, PGP Chairperson, IIM Amritsar. Prof. Swain took students and parents through the exciting two-year journey of IIM Amritsar, presenting the numerous opportunities awaiting them at the campus. He emphasized that the purpose of the program is to develop bright, enthusiastic and highly motivated individuals into management leaders and change agents in the global arena. He noted that the participants’ with relevant industry experience would make the overall learning experience of the batch more interesting. He urged the participants to make the most out of this Programme and from their fellow batch-mates This was followed by the speech by Prof. Kulbhushan Balooni, Mentor Director, IIM Amritsar. He extended a warm welcome to the new batch of students and the guests. He was glad to inform that the Institute is emerging as the most desired destination for students among the new IIMs. He enumerated the institute’s accomplishments and highlighted the various opportunities at the institute. He advised the new batch to be ambitious at the same remain focused on addressing the social issues as well the gathering with the rigors of the selection process and the growing popularity of the Institute. He further emphasized how IIM Amritsar is the only IIM in the history of IIM institutions to double the batch intake in the second year of inception. He further quoted that both final and summer placements are spectacular and are way better than many 3G and some of the 2G IIMs. Followed by that, Shri Gupta addressed the batch asking them to develop their personality in all the verticals of management. He appreciated the tireless efforts of Prof. Kulbhushan Balooni, mentor director, IIM Amritsar in building and nurturing the institute. Ms. Samiksha Sahu, Student of PGP02 addressed the new batch and shared their experiences and expectations from the new batch. 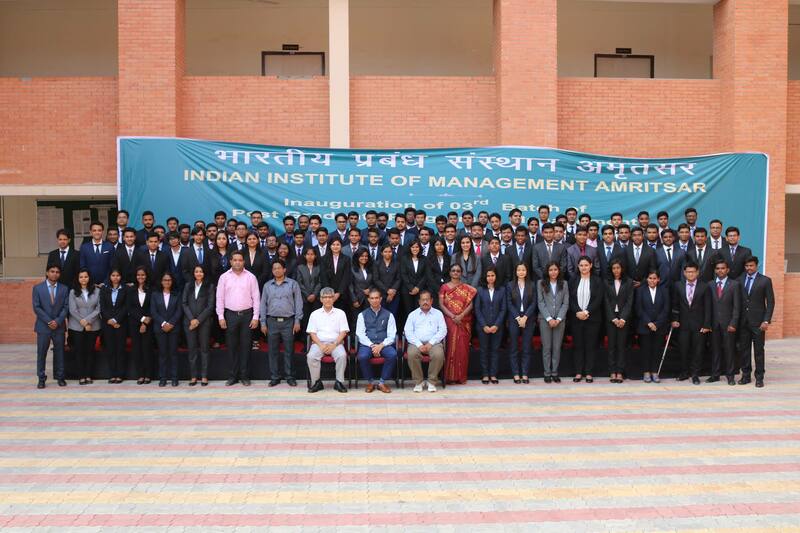 Aishwarya Sara Mathew, a student from the new batch talked about her journey to IIM Amritsar and shared her expectations from the IIM Amritsar fraternity. The session was concluded successfully with the National Anthem.